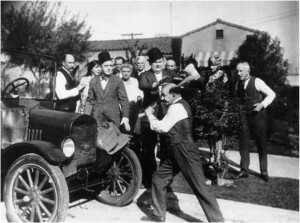 The Hal Roach Studio produced some of the best short subjects of the 1920’s and 30’s, including the Laurel and Hardy, Harold Lloyd and Our Gang comedies. 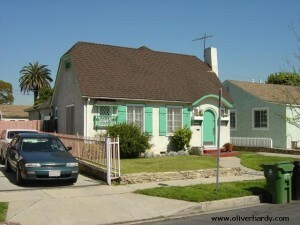 The studio was located at 8822 Washington Blvd in Culver City, near railroad tracks at National Blvd. Demolished in 1963, a marker exists on the southwest corner of National and Washington Boulevards. It was the “Laugh Factory to the World”. 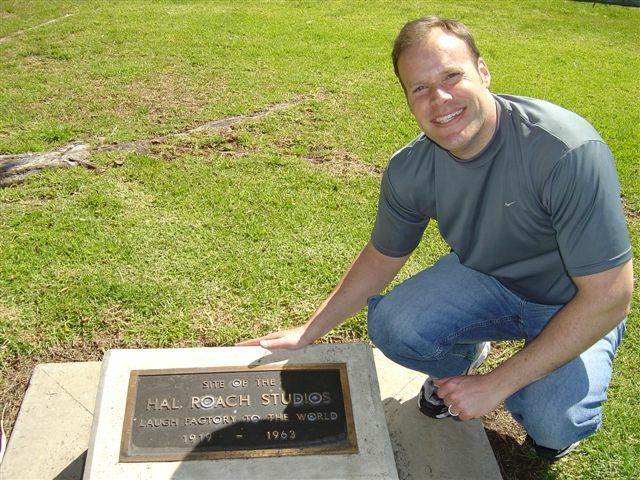 In the 1940’s the studio was labeled “Fort Roach” because armed service people such as Ronald Reagan were stationed there making training films. 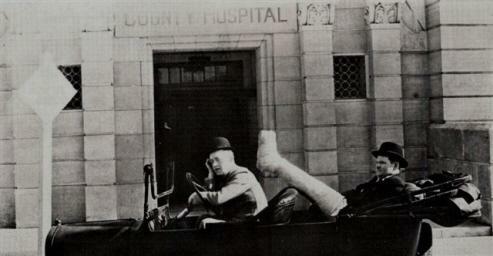 The exterior front of the building remains somewhat like it looked in the 1932 short “County Hospital”. It is located at 9770 Culver Blvd in Culver City. 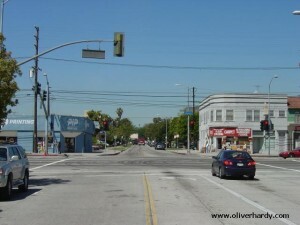 This is downtown Culver city at the intersection of Venice Blvd and Main. Note how the two buildings in the background haven’t changed much. 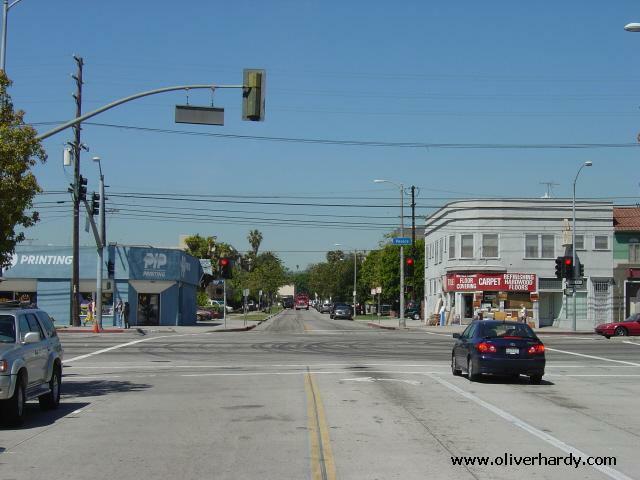 Culver city still has a small town feel without super heavy traffic. So, I had no problem getting this shot. 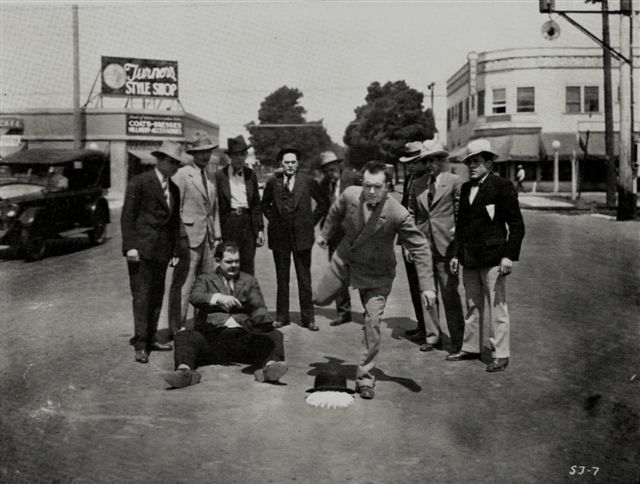 Hats Off is a silent 2 reel film from 1927. It’s been presumed lost for many years. 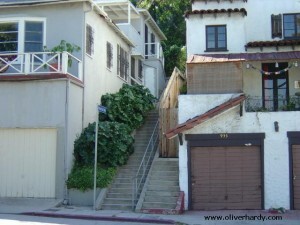 Here’s the famous steps which were used in both “Hats Off” and “The Music Box”. 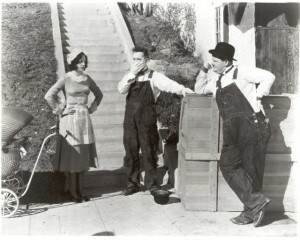 Compare the background in my perspective shot to the photo of Oliver Hardy carrying the washing machine from Hats Off. Here is the Culver Hotel at 9400 Culver Blvd in Culver City. 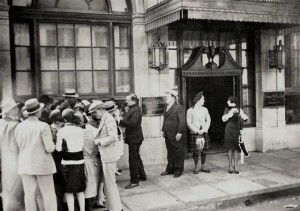 Notice that the front windows on the building look practically the same as they did 79 years ago. Stan Laurel once said that Putting Pants on Phillip is the first “true” Laurel and Hardy film, but many people, including myself, would disagree. This hotel is now a historic landmark. 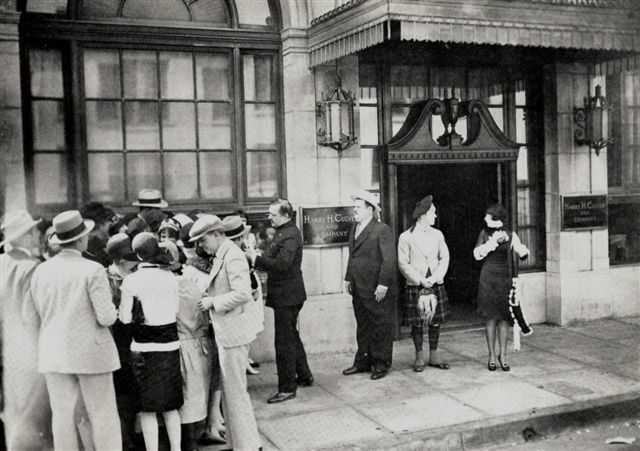 The munchkins for the Wizard of Oz stayed there during filming in the late 1930’s. 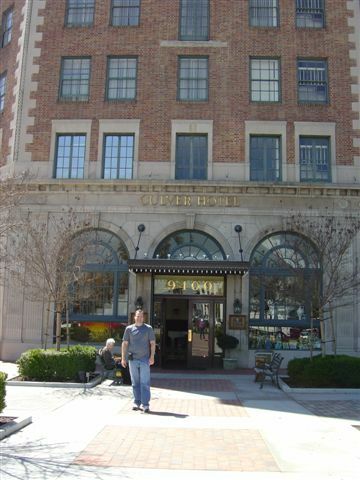 John Wayne once owned this building, and big stars like Clark Gable and Joan Crawford used to check in there. I found this house at 3120 Vera Ave. in LA (may be considered Culver City). Look at how little this house has changed in the last 76 years! 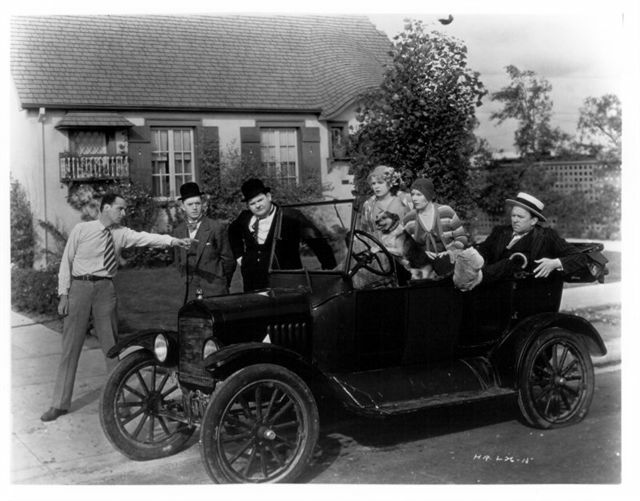 Perfect Day is a 1929 sound short subject starring the boys with Edgar Kennedy. Here’s my picture of the house owned by Jimmy Finlayson, which Laurel and Hardy tear apart in the great 1929 silent short Big Business. 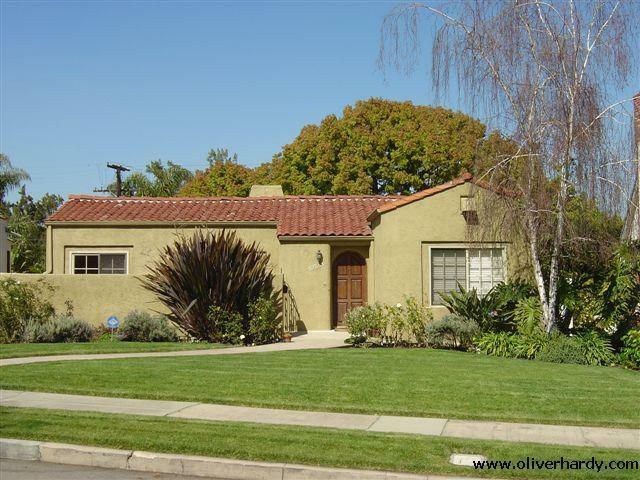 I found it in a very nice neighborhood at 10281 Dunleer Drive, Cheviot Hills, LA. Big Business was selected to the National Film Registry, Library of Congress, in 1992. The famous music box steps can be found in the Silver Lake area of LA near 927 N. Vendome Street (at Del Monte Drive) just a few blocks from W Sunset Blvd. It took years for historians to locate this spot. At the bottom of the picture you can see there’s a plaque on one of the steps. It reads: “Stan Laurel and Oliver Hardy “The Music Box” 1932 This plaque marks the site of the making of “The Music Box” winner of the 1932 Academy award for Short Subject- Comedy. The film starred comic legends Stan Laurel and Oliver Hardy, who also employed this location in their 1927 film “Hats Off”. Both films were produced by the Hal Roach Studio”. I love how you were able to find all these locations! Neat comparison. It must have been a thrill for you to be at all these locations that are a part of movie history. I find historical locations with pictures, then see how much change has happened . I also like movie locations .I believe it comes from wanting to have a touchstone to a happy time and better days? I’m very keen to find out who actually lived at 10281 Dunleer Drive at Christmas 1928. 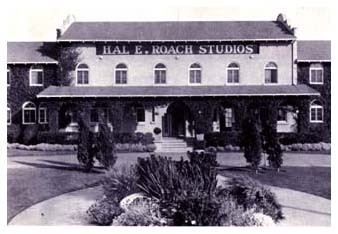 We know it was an employee of the Roach studio, who was given a lucrative deal to vacate for a while, have all repairs and restoration done and paid handsomely. The history would be complete if the name of the employee and his job at Roach is known. Please help if you can, someone! 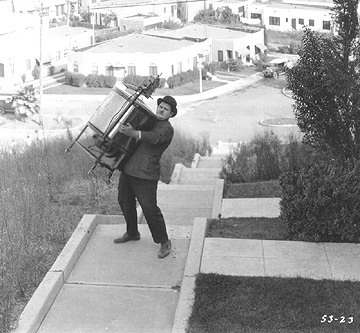 I grew up a block away fron Dunleer drive in Cheviot Hills where Laurel and Hardy filmed. There is a 20 min silent film called Bacon Grabbers film at my childhood home 10341 Bannockburn Dr. La Ca 90064 The exterior of the house is at approx 10 mins to the end. Last shot shows a very young Jean Harlow standing in front of my childhood home. “Bacon Grabbers” (1929) was just about the end for Laurel & Hardy silents, although it was originally released with a synchronized track. I favor these style shorts which were extensively shot outdoors. Thanks for your personal backstory on the house! Great job finding the then and now. I do the same for Civil War photos and can appreciate the research it takes. Do you by any chance know what building they used to shoot all the hair raising girder scenes in the film “Liberty”? It is believed the high-rise construction scenes in “Liberty” were filmed around 930 South Broadway in LA. Thanks for visiting. An excellent set of photographs. 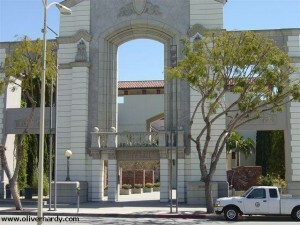 Other commentators have stated that the famous Culver City building seen in “Going Bye Bye” as the courthouse, is in fact a later reconstruction of the original, which they claim was demolished many years ago. I wonder which idea is correct? My belief is that a portion of the old City Hall building’s entrance, as seen in the movie, was retained to create the newer structure. I think it’s a nice & fresh look, with a respectful nod to the past. Thanks for the photos – ‘then and now’ comparisons are always interesting. Regarding Big Business, I was wondering if you had any information about the wide street shown late in the film when the policeman is chasing L & H ? 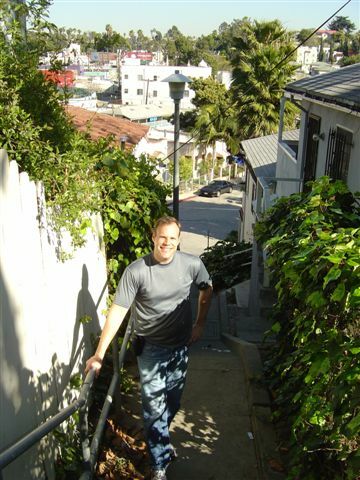 Hello Jim, it is most probably on Dusquesne Avenue looking southeastwards towards Culver City Park. I found this spot a few years ago. Best greetings from Germany.